Using design to transform lives . . . The built environment has a huge impact on all our lives. Where we work, live and play affects our well-being, our opportunities and our potential. No one knows this more than the Cabe (Commission for Architecture and the Built Environment) team at the Design Council. They have played a key role in influencing architecture and the built environment for over 80 years. The Cabe team makes places better for people. They focus on ensuring places and communities are sustainable, adaptable and resilient. Cabe at the Design Council approached The Allotment to look at how their offer could be integrated into the new Design Council brand proposition of being a ‘design navigator’. They wanted to create a document and a presentation which would convey their authority, insight and ability to inspire social and economic value in the built environment. The tone of voice needed to be ‘Inspiring Simplicity’. The project began with a series of key management interviews to obtain a more granular view of the new team's ambitions and Cabe's contribution to its stakeholders. This was followed by a wider team workshop to focus on the stories that Cabe uses to engage with its audiences from community groups to developers. These were powerful stories - from Cabe's contribution to small local community projects through to its role in the Olympics and to the support they gave to the development of the iconic 'Shard'. From this research it became clear that Cabe at the Design Council's ability and value came from the fact that, because of their impartiality (they are charity formed by a Royal Charter) and expertise, they could sit in the middle of the three main stakeholders in the built environment - the architects and developers, the local and national planning authorities and finally community groups. They can act as independent advisors to each or all of these groups. They can bring them 'together to realise the potential' of their projects. An idea that goes to the heart of what Cabe believes - that better design can be achieved through partnership and direction. Our challenge was to translate this concept into a sales brochure which would be relevant for each of their audiences whilst communicating this big idea of 'collaboration' and its benefit. This was achieved by a clever format which would allow three tailored covers plus a pocket for individual case studies (powerful stories) that illustrated the value of Cabe's advice. 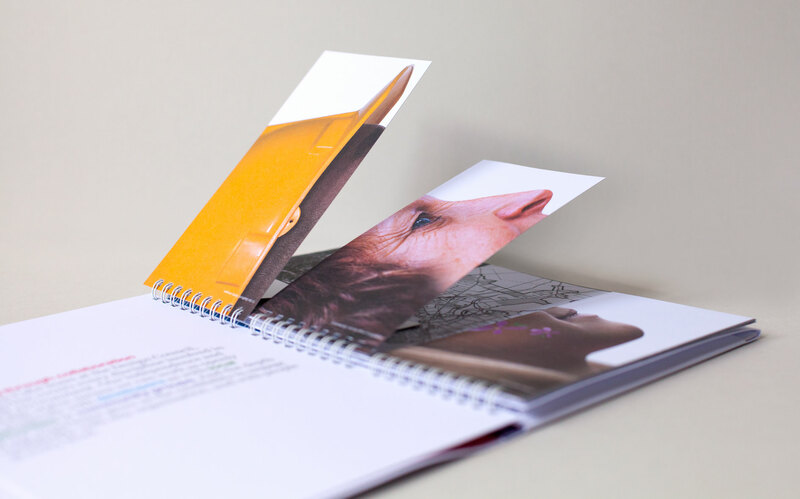 The folding pages and clear colour coding allows the reader to easily navigate the document and see the picture from their own perspective as well as others. We helped Cabe at the Design Council to simplify their offer, segment their audience messaging and communicate their stories with clarity and intelligence.